They will do anything at all. They will do anything at all. What confounds me is that people are going to believe the sheer absurdity they are dishing out because it sounds plausible and certainly good. My question is: For those with such political sagacity, why did it take over 2,900 days to reach this conclusion? Is this a new angle to the drama to make it more interesting for the paying public ‘ the electorate? Was this a great secret that had to come out at the right time, now that India can say we are not just the largest but also the most ‘decisive’ democracy in the world, rigging or no rigging? Or is this one more sneaky trick? They are now saying that there was a bomb inside the mosque, so they, helpless little boys, had to do something about it. What next? A Holocaust because Muslims do not have a foreskin? Yes, I am dramatizing, but it is the only way to deal with the tamasha that is going on. 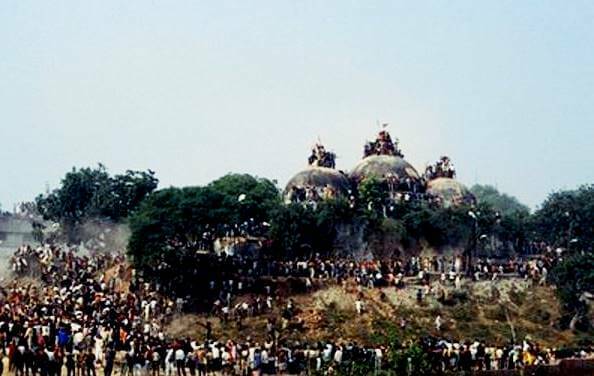 A while after the demolition of the Babri Masjid I had written about how the mosque itself may not be important to the Muslims, but what after that? Where will it start and where will it end? I knew it. These people talk with a forked tongue. That man, our prime Minster, wears a skull cap, talks about peace and then has the gall to rake up an issue that is more important to the Muslims than guns-down. To say that the Ram mandir is a matter of national sentiment and then to retract it can only mean one thing: that he is not his own person. We Indians have had dreamers as rulers, brags as rulers, shortsighted people as rulers, but never a bunch of nitwits. People were wondering what I had been upto ‘ doubting the sincerity of the present government when it called for a ceasefire; now you know. However emotional my arguments may sound, I am raising points that are of far greater national sentiment than those of the people we are doomed to call our leaders. I was aware that this was coming and a month ago I had begun to speak about it in print. Here is the sum of most of the important dimensions to this bizarre farce. The government tries hard to distance itself from the rabid factions when it suits its purpose. The others do the dirty work and when the trap has been set, the BJP moves in for the kill. I think it is their seven-year itch come a winter too late. Which is why they are redoubling their efforts. The Vishwa Hindu Parishad started getting into its amorous act by forming a ‘dharma sansad’ and a mass awareness programme; its dedicated workers planned to go out to three lakh villages and set up ‘Ram sankeertan mandals’. All this was to be done around the time of the ‘kumbh mela’ in January, a wonderful opportunity to cry itself hoarse in public; it probably thrives best in its exhibitionist form. And who are its supporters? The voyeurs who get their hormones all jiggling when they see this full-blooded display of testosterone. I am a sucker for sob stories and my heart goes out to the underdog. Any group of people so desperate about the construction of a temple for the pure kick of it have got to be terribly frustrated souls. I could understand public anger during the time of the barbaric Mughal emperors, when they went on a rampage; destruction of something that one considers holy or very dear is always cause for acrimony. But when the construction of something you have never seen becomes an issue, it must be understood that there has got to be a deep psychological malaise. How can I have a quarrel with sick minds? A mind like VHP senior leader Giriraj Kishore’s that believes in educating the masses by getting them ‘to force the government to allow the work (of temple construction) unhindered’. We are supposed to be living in a democracy where we elect our representatives. Imagine having to compel it to let a temple be constructed and not bother about schools, water, health, literacy and other such issues. I think this is passion gone haywire. When asked if the NDA allies would permit it, our ‘neta’ says, ‘Don’t they want votes?’ Touch’. So, why am I ready to sign on the dotted line for the mandir construction when I know that it is anti-government, anti-secular, anti-common sense? Because I believe that once all of us superior individuals give our consent and just let these people go on a rampage, their ardour will be dampened. If there is no Emperor Akbar, then why on earth would Anarkali have to sing, ‘Jab pyaar kiya to darna kya”? All these sadhus will wonder what they have to do in Ayodhya. It is a small place with no entertainment value and the inhabitants there don’t care about what happens. Besides, after a while, the truckloads of people they bring wearing saffron bandannas will return home once the ‘nasha’ of the ‘bhang’ has worn off. So, what will those revered men do after burping over the ‘bhaat-barfi’? I feel rather sorry for their plight. People have made very sombre suggestions about what can be done at the ‘disputed site’. Hospitals, welfare institutions, a memorial for communal harmony and whatnot. I think that since it is love that has got them all rollicking, we may as well talk about the real thing. Why not just install a good, politically savvy Hindu couple as the reigning deities there (Hinduism has a human face and has no problems with a variety of gods, remember?) and transform it into a modern-day kingdomality with equal opportunities and rights for everyone, especially the women, who may not be somebody’s fourth wife, but she still has to suffer many other indignities. I think such a move will deflate all those egos and send the right message to the right people. That Indians do not live in a past they cannot handle. And what about the Babri Masjid ‘ shouldn’t there be something done to restore it/recreate it? I shall quote Nida Fazli here: ‘Ghar se masjid hain bahut door, chalo yun kar le/ Kisi rote hue bachche ko hasaya jaye.’ I think that is what I am doing to all those Sangh parivar people. Since the mosque is some distance away, I am giving the cry babies a reason to smile. As per my good old Indian tradition, I would love to welcome the ‘sevaks’ to Ayodhya. I hope they will be comfortable. Apna hi ghar samajhna! Farzana Versey is a widely read and respected author and columnist in India.